Amy McCafferty’s success as a real estate sales professional in Silicon Valley has made national news! With more than 1.3 million agents in the United States, Amy ranks in the top 100 nationwide. She ranks in the top 20 in the entire San Francisco Bay Area, and locally, she is the top-producing individual agent at Alain Pinel Realtors, Los Gatos California. Her dedication, experience and expertise in local markets have enabled her to attain the status of being among the best of the best in real estate. While Amy’s high-level sales volume has earned her recognition on a grand scale, she manages to keep her service personal, one-on-one boutique style. From the pre-sale process through the close of escrow, Amy manages all aspects of the sale including the property preparation, marketing, contract negotiations and closing. After close of escrow, she remains in contact as your trusted real estate advisor. Amy understands that buying Bay Area real estate can be one of the single largest investments. She knows the importance of listening and having an open and honest dialogue. She realizes that buying or selling a home can be complex and emotionally charged. 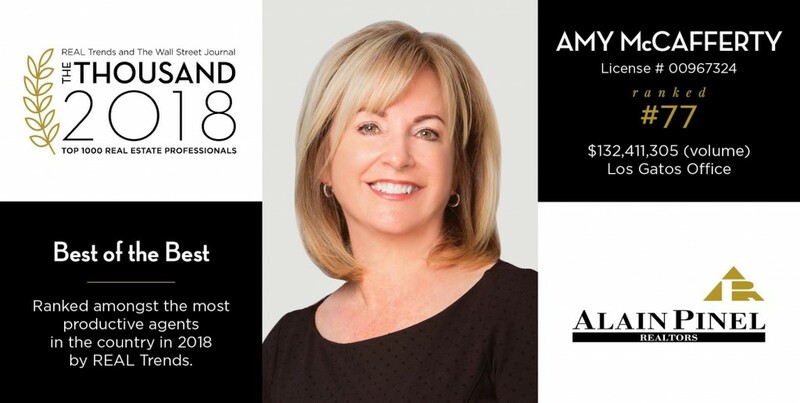 For all these reasons and more, Amy takes her role as your trusted advisor very seriously and tailors her services to fit your unique needs while providing clear communication, attention to detail and thoughtful solutions along the way. She is dedicated to helping her clients achieve their real estate goals. This content last updated on 04/21/2019 07:21 AM.